A California condor is receiving treatment at the Oakland Zoo for lead poisoning. 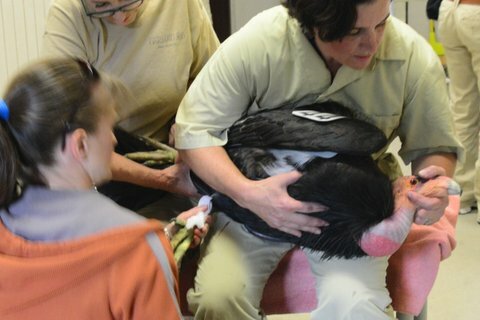 She's the zoo's first condor patient at their new(ish) animal hospital. In fact, she's the first condor to be treated in Northern California. Before the zoo opened its facility, the only place set up to care for wild condors was the Los Angeles Zoo. "It's kind of a bittersweet thing," said Dr. Andrea Goodnight, the associate veterinarian at the Oakland Zoo. "We are really excited to be able to help and treat these birds, but on the same side we're pretty sad that we still have to treat these birds." Here's Condor #444 getting settled in at the zoo. Biologists trap wild condors twice a year to test them for lead poisoning. Last week, Condor #444 tested positive in Pinnacles National Park. Luckily, said Goodnight, she wasn't showing any symptoms yet. "Lead is a neurological toxin," she said. "One of the things you see in wild animals is they just can't hunt. They can't function normally in their environment, so they're more susceptible to predators, they can't get their food, and slowly unfortunately that means they starve." Goodnight said once a bird does show clinical signs of lead poisoning, it's unlikely to recover. In this condor's case, she's gone through one round of treatment, five daily injections that pull the lead out of the blood. Now, Goodnight says, she's waiting on test results to see if the lead levels have gone down enough, or if the bird will need another round of injections. Visitors to the zoo can't see the condor in person; since she's wild, staff are trying to leave her alone as much as possible. But you can keep tabs on her with this live web cam in her enclosure. Ventana tends to spend most of her time at Pinnacles National Park. 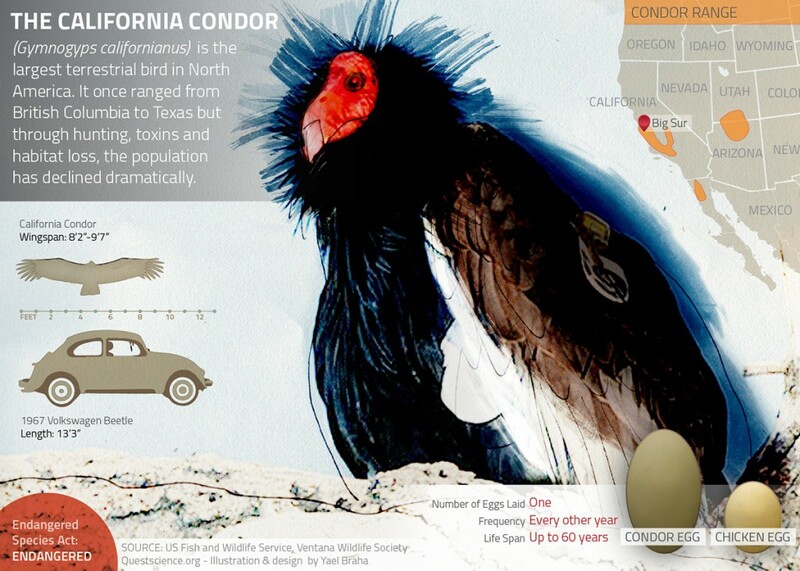 In 2012, biologists noticed that she started spending more time with Condor #340 at Pinnacles and in the spring of 2013, they had decidedly formed a pair bond when remote observations confirmed the presence of an egg in one of their favorite caves! The egg failed, but this is common for a young couple and it is much more likely that they will be successful parents next year. The zoo will release the condor back into the wild once she's well enough. California condors were on the brink of extinction 30 years ago. While their population is scrambling back, scientists say lead bullets remain a problem for them. That's because when hunters leave a carcass with lead bullet fragments behind, a condor might be the creature that cleans it up.